Happy Father’s Day!! Today is Father’s Day and we just got the kids up from “Quiet Time.” That is definitely quite the misnomer when it comes to C. That boy can’t sit still if it were the last thing on earth. It is amazing how quickly they grow up. I look at them and just can’t believe it. Jana pointed out at Church this morning that is as old as C was when she was born. That is pretty scary. The kids gave me a CD of church music (Octapella - "Worship")and a book of stories of LDS pilots ("Supersonic Saints"). Looks pretty cool. It is a bunch of short stories. Last night I had a really neat experience with the Scouts. 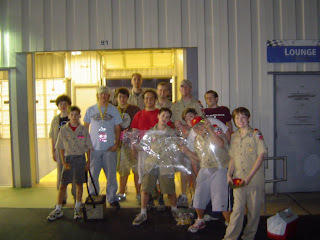 We took a group of 13 boys down to the Kentucky Speedway to the NASCAR Busch Series race. It was pretty amazing, especially for a racing nut like me. We went down there to participate in the prerace ceremonies. We went out into the infield during the opening ceremonies and held this HUGE American flag. I don’t think it really impacted the boys until they were told that there were nearly 80,000 people there and another 30 million people watching on TV. After the National Anthem ended, to hear the 80,000 people screaming and cheering brought chills to my arms, even in the heat of the day. I think I got more out of the symbolism than the boys. I hope they at least got a glimpse of the blessings they have from living in this country and why we (military) do what we do. Of course, the night only got better for me. We had passes that gave us access to just about everywhere. We were parked and located in the infield, right by the garages, but had access everywhere. We were allowed to stand and walk right behind the pits (8 - 10 feet). It was awesome to see the intricacies of what happenes there. We were able to touch the tires just as they are coming off the cars and feel the heat. 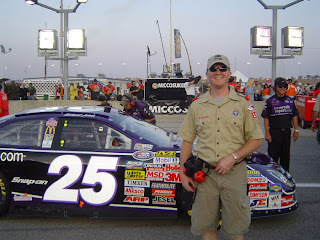 The pit crews would give the boys the lug nuts right off of the car, still smoking and hot. What a wonderful opportunity. I hope the boys realize what a blessing it was for them to be able to go around where they did. 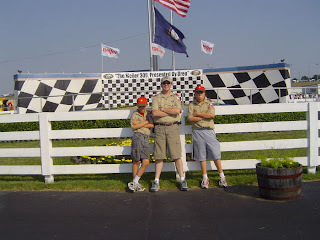 We were invited back to the Indy Car race and the Truck race later this summer. I will have to see what kind of interest the boys have. I know I would love to go back.